Background: Studying DNA methylation changes in disease condition provides the basis of disease pathogenesis or host immune response to infection. Evidences suggest that pathogen-mediated DNA methylation changes influences the expression pattern of genes contributing to disease condition to avert host immune response. Hence, we attempted to study the association between tubercle bacilli-mediated global DNA methylation changes in children with tuberculosis (TB) disease and healthy controls. Methods: Forty-three children diagnosed with TB and 33 healthy children were enrolled in this study. ELISA-based global DNA methylation quantification was performed to measure the changes in percentage of global genomic DNA methylation level. Results: Highly significant difference in global DNA methylation level was found between cases and controls and median global DNA methylation level was 6.25% (interquartile range [IQR] 2.5%–10%) in cases and 25% (IQR, 12.5%–25%) in controls (P < 0.001). Significant difference was found in GeneXpert-positive cases (P < 0.01). Receiver operating curve analysis showed that area under curve 0.81 for the total study population and 0.76 for GeneXpert-positive cases. Conclusion: The results show the significant difference in global DNA methylation level in children with TB disease that can serve as a potential biomarker in early diagnosis of TB disease. Measuring global DNA methylation level, however, not an accurate or sensitive diagnostic method but evaluating active demethylation at genome-wide level can be used to monitor disease progression and treatment efficacy. Tuberculosis (TB) disease is still a serious threat against pediatric population and the estimated proportion of pediatric population reported was 6% in total incidence in India in 2016 and 250,000 death in 1.74 million in reported pediatric TB cases. Childhood TB is ignored in endemic regions where limited resources are available that failed to identify infected population, as children are considered to develop mild forms of disease and to contribute little to the maintenance of the TB epidemic. However, children contribute a major proportion of the disease burden and suffer severe TB-related morbidity and mortality, notably in endemic areas. Hence, accelerating access to quality TB care for presumptive pediatric TB cases through improved diagnostic strategies is in urgently needed. The impact of DNA methylation alteration in cancer disease is well documented, but infectious disease like TB is unexplored. Assessing the level of DNA methylation at genome wide and gene specific could provide a better strategy to tackle TB disease in children. Hence, our objective was to measure global DNA methylation level by ELISA method in children with TB disease matched with healthy controls. This study was conducted in the Department of Paediatrics of a tertiary care referral hospital during the period of December 2014 to December 2017. The study was approved by the Institute Scientific Advisory Committee and Human Ethics Committees. Since no similar studies had been done in the past, a sample size of convenience was taken. Forty-three (n=43) children with TB disease and Thirty-three (n=33) healthy children were enrolled in this study after written informed consent. 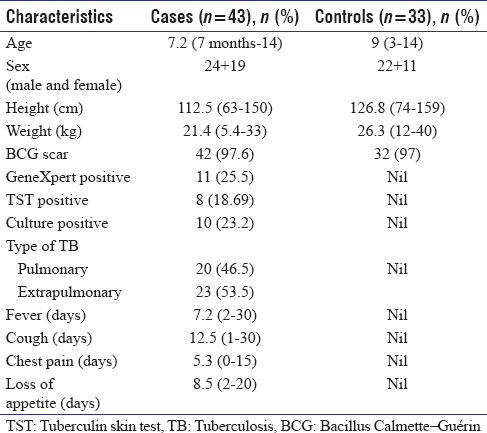 The inclusion criteria for both pulmonary TB (PTB) and extra-PTB (EPTB) infections included (<14 years, both genders): GeneXpert positive, smear positive, culture positive, chest X-ray positive, skin test positive, and clinical findings of TB infection. The inclusion criteria for healthy donors (<14 years, both genders) included no signs of TB and other infections, HIV negative, no surgical procedures underwent recently, asthma, and no other lung problems. Blood was collected from both groups and FavorPrep Genomic DNA Mini Kit (Favorgen, Taiwan) was used according to the manufacturer's instructions. Briefly, 300 μL of whole blood was used to isolate genomic DNA with elution volume of 50 μL and Nanodrop 2000 spectrophotometer (Thermo Scientific, USA) used to measure the concentration of genomic DNA. The concentration of 5-methylcytosine (5-mC) in genomic DNA was quantified using 5-mC DNA ELISA kit (Zymo Research, USA) according to manufacturer's instructions. Fully methylated DNA (100% M) and fully unmethylated DNA (100% U) were used as positive and negative controls, respectively. 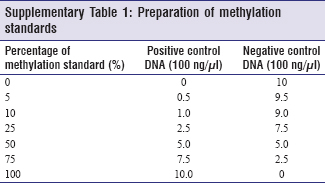 The concentrations of 0%, 5%, 10%, 25%, 50%, 75%, and 100% of methylation were prepared [Supplementary Table 1] by mixing of both M and U DNA to prepare a standard curve. Briefly, 100 ng of genomic DNA was added in a PCR tube and made up to 100 μL of total volume with 5-mC coating buffer and denatured by heating at 98°C for 5 min in a thermal cycler (Eppendorf Mastercycler, Germany) and transferred immediately to ice for 10 min. Denatured DNA samples were added to 96-well microtiter plate covered with foil and incubated at 37°C for 1 h. Wells were washed three times with 200 μL of 5-mC ELISA buffer and 200 μL of 5-mC ELISA buffer was added to each well and incubated at 37°C for 30 min. Anti-5-methylcytosine and secondary antibody mixture were prepared in the ratio of 1:2:2000 in 5-mC ELISA buffer and 100 μL of this antibody mixture was added to each well and covered with foil and incubated at 37°C for 1 h.
Wells were washed three times with 200 μL of 5-mC ELISA buffer and 100 μL horseradish peroxidase developer solution was added. The plate was kept in room temperature for 60 min for color development. Absorbance reading was measured at 450 nm using ELISA plate reader (Robonik Readwell Touch 3·400A, India). Triplicates were performed to each sample to validate the results. Categorical data were expressed as numbers and percentages. Percentage (%) of genomic DNA methylation level was expressed in the median with interquartile range (IQR) and Mann–Whitney t-test was performed to evaluate the difference in % 5-mC between cases and controls. Receiver operating curve (ROC) analysis was performed to evaluate the cutoff value of % 5-mC in the study groups. All statistical analyses were carried out in IBM SPSS Statistics for Windows, version 19 (IBM Corp., Armonk, N.Y., USA) and MS-Excel at 95% confidence interval with P < 0.05 was considered as statistically significant. 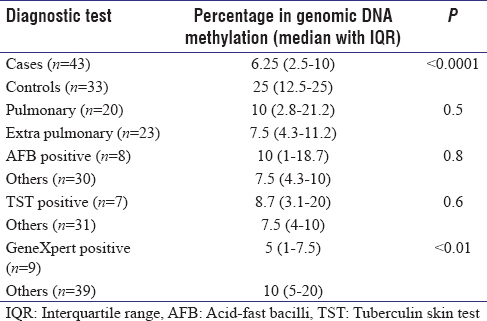 TB infected children included in this study settings were homogenous population with respect to demographic characteristics [Table 1], and genomic DNA methylation level was analyzed between cases and healthy controls. 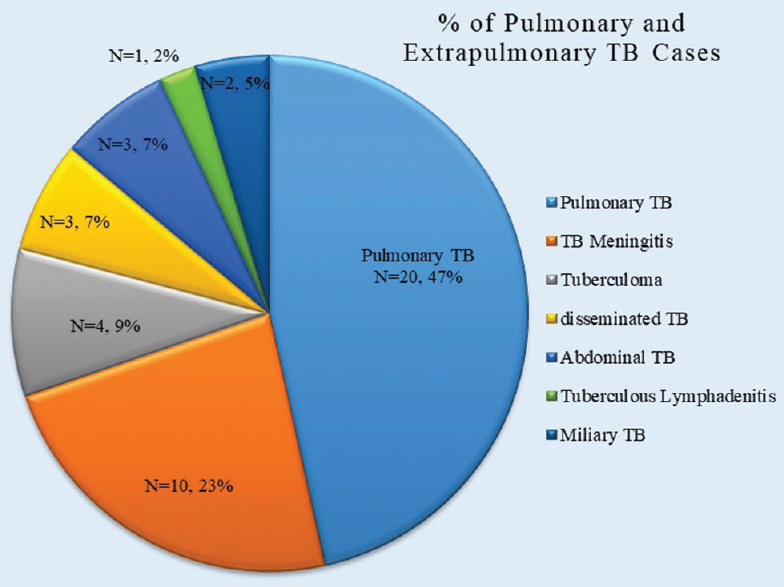 Among the 43 cases, 20 (46.5%) were PTB and 23 (53.5%) were EPTB and frequency of EPTB cases enrolled in this study represented in [Figure 1]. Significant difference in percentage of global DNA methylation level was found between cases (n = 43) and controls (n = 33) and difference in percentage of global DNA methylation level expressed in median within cases 6.25% (IQR, 2.5%–10%) and in controls 25% (IQR, 12.5%–25%) (P < 0.0001) [Figure 2]a. The median distribution of percentage of global DNA methylation among different diagnostic procedures is represented in [Figure 2]b. No significant difference in percentage of global DNA methylation level was found between PTB and EPTB included in this study in relation with clinical outcome [Table 2]. Significant difference in percentage of global DNA methylation level was found in GeneXpert-positive cases (P < 0.01) and no significant in difference in percentage of global DNA methylation level was found in various diagnostic procedures performed for TB cases [Table 2]. ROC analysis showed a cutoff value of 12.5% of genomic DNA methylation between cases and controls, and it can be used as a diagnostic threshold value to differentiate cases from controls, with 75% sensitivity and 84% specificity (P < 0.0001) [Figure 3]. 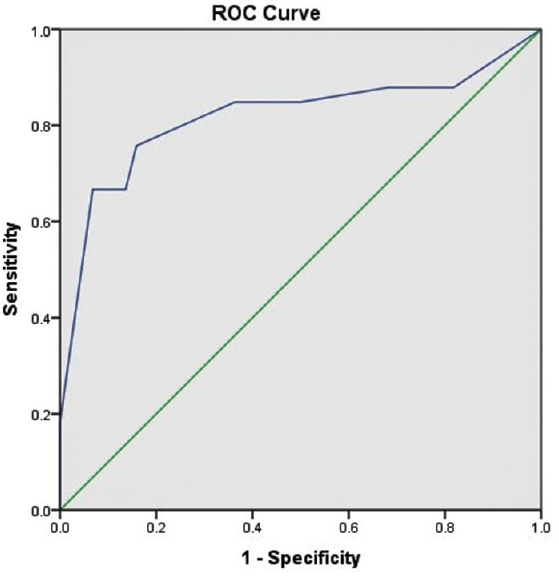 ROC analysis for GeneXpert positive cases with a cutoff value of 6.2% of genomic DNA methylation showed the diagnostic value of 5-mC quantification analysis in accordance with GeneXpert procedure to promptly diagnose children with TB disease with sensitivity 69% and specificity 66% P < 0.01 [Figure 4]. Most of the CpG sites and CpG islands are unmethylated, and its associated genes found to be expressed in a healthy individual genome.,, Conversely, discrete CpG sites are found to be mostly methylated that impacts the repression of gene-specific loci. Notably, unusual loss in gene-specific methylation and manifestation of global hypomethylation possibly lead to overexpression of genes that are contributing to disease progression. Several reports suggested that DNA methylation is the driven force behind reshaping host epigenome under TB infection and many immune defense genes undergone changes in its expression., Global hypermethylation shuts down immune defense genes and global hypomethylation activates immunosuppressive genes to contribute disease progression in host.,, The balance between hyper- and hypomethylation is a crucial checkpoint for host to activate or suppress appropriate immune response against infection. Tubercle bacilli modulates host transcriptional machinery to avert host immune response to ascertain its infection further. The innate immunity when combines with active, adaptive cell-mediated immunity shows higher protective effect against TB infection; however, in some cases, it fails and infection progresses into disease., Several factors are determining TB pathogenesis in children, namely, host genetics, mycobacterial virulence factors, malnutrition, and HIV co-infection but undeveloped immune response contributes majorly the high rate of progressive TB in children. Homogenous population of TB cases and healthy controls was enrolled in this study to measure global DNA methylation changes. This study shows the significant hypomethylation among TB cases when compared to healthy controls. The alteration in genomic DNA methylation level among cases and controls indicates that DNA methylation changes that control host immune behavior through underlying gene expression. The hypomethylation in TB patients supports the notion that activation of specific genes that are contributing to diseases progression in TB infected host;, otherwise, it may influence several immune response genes to respond against TB disease in children. Clinical features and TB disease with respect to DNA methylation changes do not correlate and there was no significant difference observed. PTB cases have shown higher DNA methylation level when compared to EPTB cases [Table 2]; however, it fails to meet diagnostic standards. Various diagnostic procedures were included to recruit TB cases and out of all GeneXpert is the standard method for the diagnosis of TB infection in adults and pediatric populations. There was a significant difference in percentage of DNA methylation level was observed among GeneXpert-positive cases [Table 2]. A cutoff value of 12.5% for genomic DNA methylation was observed to discriminate cases from controls with 75% sensitivity and 84% specificity and Cutoff value of 6.2% with sensitivity 69% and specificity 66% for genomic DNA methylation was observed in GeneXpert-positive cases. ROC was generated to investigate the accuracy of the 5-mC test performed to differentiate cases from controls. Accuracy was measured by the area under the ROC curve and 1 represents a perfect test and 0.5 indicates a worthless test. 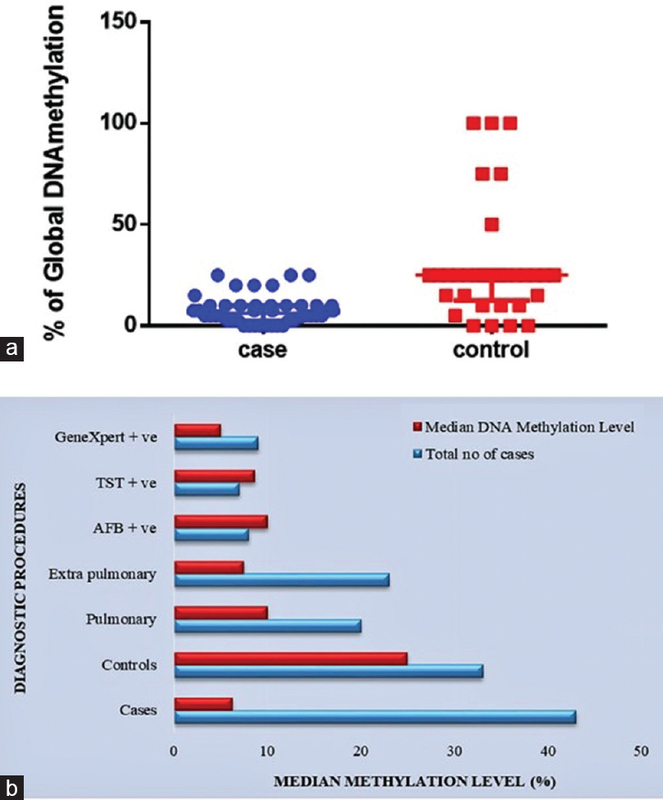 The study measured percentage of global DNA methylation among cases and controls that was 0.81 for total cases and 0.76 for GeneXpert-positive cases and these differences are statistically significant. Hence, proved that 5-mC methylation quantification test performed in this study has the ability to differentiate children with TB disease from healthy controls effectively. Collectively, the study findings show that active global hypomethylation changes could play a substantial role in regulating host immune response against TB disease in children. Furthermore, it indicates the possibility of demethylation in specific repeat elements or genes can be more disease specific. This result ought to be followed by more in-depth DNA methylation analysis at gene loci specific by using bisulfite sequencing or pyrosequencing strategies to comprehend the epigenetic dynamics, how it interacts and regulates host immune response under TB disease. We are grateful to the children and their parents who gave consent for the participation. We thank our institution for providing enough resources to accomplish the study. The authors greatly acknowledge Jawaharlal Institute of Postgraduate Medical Education and Research (JIPMER) Intramural Research grant for financial support. Jenkins HE. Global burden of childhood tuberculosis. Pneumonia (Nathan) 2016;8:24. India TB Report 2018; 2018. Available from: htp://www.tbcindia.gov.in. [Last accessed on 2018 Mar 24]. Raizada N, Khaparde SD, Salhotra VS, Rao R, Kalra A, Swaminathan S, et al. Accelerating access to quality TB care for pediatric TB cases through better diagnostic strategy in four major cities of India. PLoS One 2018;13:e0193194. Marais BJ, Gie RP, Schaaf HS, Beyers N, Donald PR, Starke JR, et al. Childhood pulmonary tuberculosis: Old wisdom and new challenges. Am J Respir Crit Care Med 2006;173:1078-90. Marais BJ, Schaaf HS. Childhood tuberculosis: An emerging and previously neglected problem. Infect Dis Clin North Am 2010;24:727-49. Tollefsbol T. Handbook of Epigenetics: The New Molecular and Medical Genetics. Oxford, UK: Academic Press, Elsevier Inc; 2011. Waddington CH. The epigenotype 1942. Int J Epidemiol 2012;41:10-3. Simmons D. Epigenetic influence and disease. Nat Educ 2008;1:6. Bierne H, Hamon M, Cossart P. Epigenetics and bacterial infections. Cold Spring Harb Perspect Med 2012;2:a010272. Huh I, Zeng J, Park T, Yi SV. DNA methylation and transcriptional noise. Epigenetics Chromatin 2013;6:9. Wilson AS, Power BE, Molloy PL. DNA hypomethylation and human diseases. Biochim Biophys Acta 2007;1775:138-62. Esterhuyse MM, Linhart HG, Kaufmann SH. Can the battle against tuberculosis gain from epigenetic research? Trends Microbiol 2012;20:220-6. Kim KH, An DR, Song J, Yoon JY, Kim HS, Yoon HJ, et al. Mycobacterium tuberculosis Eis protein initiates suppression of host immune responses by acetylation of DUSP16/MKP-7. Proc Natl Acad Sci U S A 2012;109:7729-34. Scharer CD, Barwick BG, Youngblood BA, Ahmed R, Boss JM. Global DNA methylation remodeling accompanies CD8 T cell effector function. J Immunol 2013;191:3419-29.
Cooper AM. Cell-mediated immune responses in tuberculosis. Annu Rev Immunol 2009;27:393-422. Kleinnijenhuis J, Oosting M, Joosten LA, Netea MG, Van Crevel R. Innate immune recognition of Mycobacterium tuberculosis. Clin Dev Immunol 2011;2011:405310. Newton SM, Brent AJ, Anderson S, Whittaker E, Kampmann B. Paediatric tuberculosis. Lancet Infect Dis 2008;8:498-510.